Taking Back Sunday are streaming their new video for “Flicker, Fade” off their upcoming album, Happiness Is, due out March, 18th. Special pre-order packages are available over on Hopeless Records. The band will be hitting the road with The Used this spring. Check out the dates below. Taking Back Sunday will be hitting the road this fall for a nationwide headlining tour. The band will be visiting cities they haven’t yet visited with their new self-titled album. The Maine and Bad Rabbits will be supporting the band. 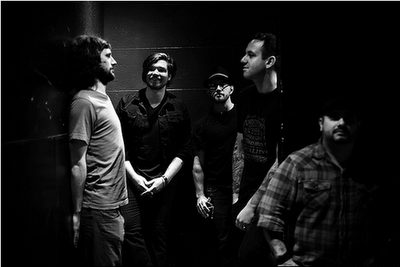 Taking Back Sunday‘s new video for “Faith (When I Let You Down)” can be seen below. The song comes from the bands new [itunes link=”http://itunes.apple.com/us/album/faith-when-i-let-you-down/id443835463?uo=4″ title=”Taking Back Sunday – Taking Back Sunday” text=”self-titled album”] in stores now. Taking Back Sunday are streaming their new self-titled album on their Facebook page. The album is due out next Tuesday June 28th. Taking Back Sunday have set June 28th as the release date for their new self-titled album. The self-titled release marks a return to the band’s original line-up from their 2002 debut Tell All Your Friends: vocalist Adam Lazzara, guitarist Eddie Reyes and drummer Mark O’Connell have reunited with vocalist/guitarist John Nolan and bass player Shaun Cooper, who departed in 2003. Tell All Your Friends has sold over one million records worldwide, spawned breakthrough anthem “Cute without the ‘E’ (Cut from the Team)” and launched the band as one of the most influential of its generation. Recorded in Los Angeles with producer Eric Valentine (Queens of the Stone Age, All American Rejects), Taking Back Sunday is the New York Band’s fifth studio album, three of which have been certified gold. The first song off the album, “El Paso,” has already become a fan favorite, and debut single “Faith (When I Let You Down)” will be available starting May 3rd. A special pre-order will be available to fans starting today only at www.takingbacksunday.com. The limited-edition package includes the new album as well as a second bonus disc with six additional demo tracks and an instant MP3 download of “El Paso”. The pre-order also includes 11 1’x1′ posters with unique art inspired by each song off the album, with copies of lyrics handwritten by Adam on the back of each poster. Each package will be signed by the band. The track listing and album art can be seen below. A new song has been posted by Taking Back Sunday on their YouTube account called “El Paso.” It was announced last year that the band would be working on their 5th studio album with the original line-up. The band revealed today that the album would have a June 28, 2011 release date. The full lineup for this years Bamboozle Festival has been released. The three-day event in New Jersey will include headliners 30 Seconds To Mars, Taking Back Sunday and Lil Wayne, as well as Anberlin, Travie McCoy, A Day To Remember and many others. The full lineup of bands can been seen over on the Bamboozle website. Tickets are also available now for the event in single day and three day passes. The Bamboozle Festival, the annual three-day music extravaganza scheduled for April 29, 30 and May 1 at the New Meadowlands Stadium in East Rutherford, New Jersey has announced additional main stage performers. Newly added main stage performers include: Lil Wayne, MÃ¶tley CrÃ¼e, Taking Back Sunday, The Gaslight Anthem, Wiz Khalifa, Bruno Mars, LMFAO, Chiddy Bang, and Dashboard Confessional. These bands will be joined by previously announced main stage performers including A Day To Remember, Boys Like Girls, New Found Glory with Marky Ramone, Circa Survive, Waka Flocka Flame, Streetlight Manifesto, and the RX Bandits. Tickets for three-day packages are currently available for purchase. For ticket information as well as additional artists announced please visit: www.thebamboozle.com. More confirmed performers will be announced shortly for The Bamboozle Festival, as well as information about The Bamboozle Roadshow 2011.